Each time a Spell Card is activated, place 1 Spell Counter on this card when that Spell Card resolves (max 3). You can Tribute this card with 3 Spell Counters on it; Special Summon 1 "Buster Blader" f..
Each time a Spell Card is activated, place 1 Spell Counter on this card (max 3). 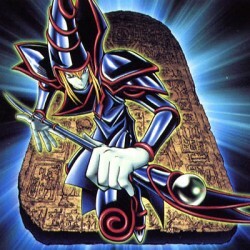 You can Tribute this card with 3 Spell Counters on it to Special Summon 1 "Dark Magician" from your hand, Deck, or Grav..